National Institute of Genetics (NIG) aims not only to conduct high quality research, but also to create new research fields for the future science and to nurture human resources that play key roles in this process. 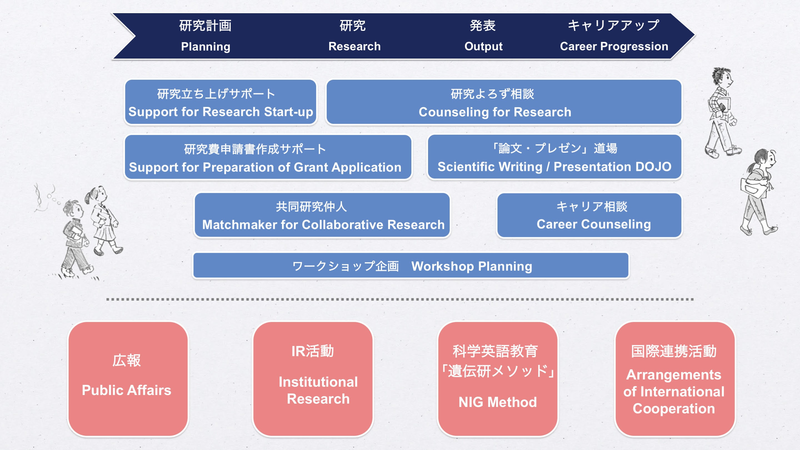 To contribute to this end, the Office for Research Development offers various help to those involved in research for further development of its research and research abilities. Activities of our office include organizing workshops, mediate collaborative research, support preparation of manuscripts and scientific presentation, arrange international cooperation, and support research infrastructure such as operation of common equipment. We will also act as a “sounding board” on which you can try out your ideas on your research and research proposals. Synergizing with the superb research environment and the interactive atmosphere of NIG, we hope that our activities will be an additional appeal of the Institute. Satoko SATOU, Ms. / Rieko SUGIYAMA, Ms. / Sumire YAMASHITA, Ms. / Mimoko SHIMIZU, Ms. Copyright © 2017 Office for Research Development National Institute of Genetics All Rights Reserved.